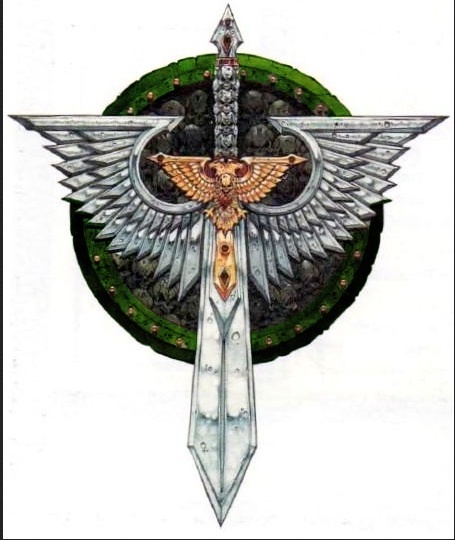 Last month I posted my first impression of the Dark Angels Codex. I have had time to really digest it and play a few games with it, but I still find it rather difficult to completely wrap my arms around. Given the events over the past few weeks with Games-Workshop and the online community exploding with negativity, I’ve decided to do a couple of editorials. 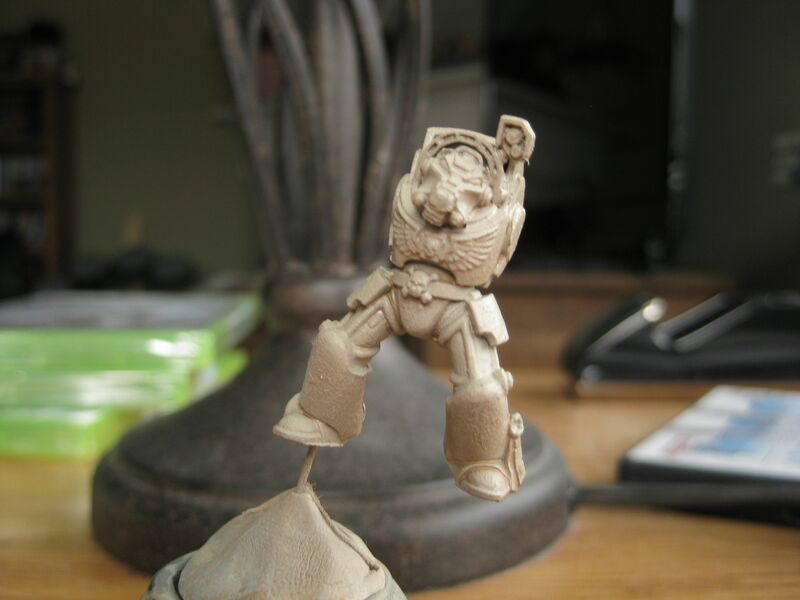 This naturally will be an addition to the other columns that I’ve been trying to do (namely the Horus Heresy tactica). With these editorials, I will try to not generate more negativity. I will more than likely fail at that goal. Really, I just want to point out faults and then discuss ways to improve them, so let us dive in. What’s wrong with the Dark Angels codex? On the whole, there isn’t much wrong with it. It’s more of a series of small annoyances and problems that stack up to make the codex feel a bit off-putting. Many comments and forums have praised its level of balance. However, I’m in the camp of the few who think that think it’s balanced to the point of being bland. I’ll take a moment to list the faults I think the book has. Right now, I just want to put down some broad strokes about the book. We could spend a whole column on the grammar mistakes and rule mistakes this book has, but that would bring up obvious points. I do believe those mistakes reveal that Games-Workshop rushed the codex, and probably wanted a test bed for other space marine armies. Another key fault with the codex, I don’t know if it’s due to rule mistakes or a grand Games-Workshop plan, is the subtle push to make players pick a particular unit, not take a particular unit, or have a particular unit composition. Since I consider myself a narrative or fluff player, many of these rules mistakes or the push to make me use a particular unit in a particular way is a bit of a coin toss. While the rule mistakes and grammar mistakes are annoying to my English degree background and personal level of professionalism, they don’t make me want to quit the game or throw the codex away. However, the push to make me choose a particular unit or use that unit in a way that Games-Workshop feels or wants it to be used really ruffles my feathers. I’ll go into detail about that as I go over the list of units. Again, since I consider myself a narrative player, I look to the “fluff” in the front of the book to give me inspiration and explanations to the rules and option chooses that are in the army list. Very little was done in terms of “fluff”. Yes, things were given a bit more detail, but no new fluff or characters were added. There are sparks of interests, and things I would love to see played out on the table. However, there’s not really a way to play out the fluff of the Dark Angels given the army list’s options and rules. How would I have it? That’s a great question which leads me to the heart of this post. 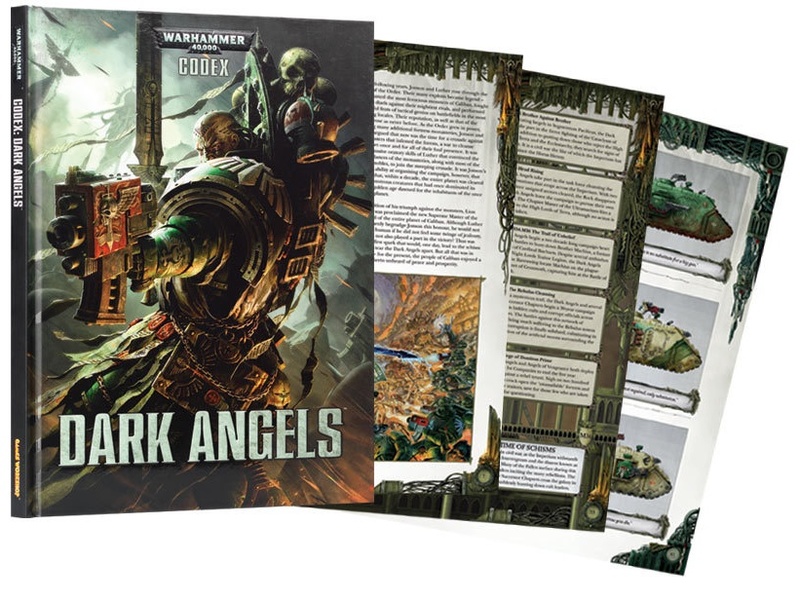 Warlord Traits and Dark Angels Special Rules – None of the warlord traits, in the big rule book or here in the Dark Angels codex, are particularly spectacular, and I don’t think they are meant to be. However, the Dark Angels seem to suffer a bit more from them. For starters, all the special characters except Sammael and Azrael have The Hunt warlord trait. While it’s a fluffy and narrative rule, I kind of would like a bit more variety, or traits that better represented the character. Maybe Ezekiel could have had a psychic warlord trait where he sees into the future or the hearts of men, or simply give him the Brilliant Planning warlord trait. The warlord traits that the Dark Angels do have are really lackluster. Out of the six there are only three that I would consider Dark Angels flavored and useful. Courage of the Lion I find particularly useless given the high leadership of space marine HQ choices, Grim Resolve that the whole army has, and the addition of the banners. This and the Dark Angels special rules could have been improved by introducing more special characters. These other characters could have been squad upgrades similar to the Sergeant Telion from the Codex: Space Marines or the Arjac and Lukas from the Space Wolves codex. 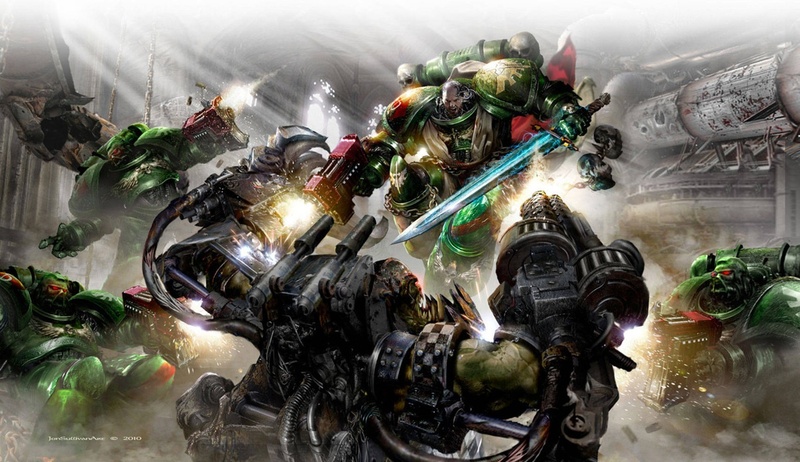 These characters could have added more Dark Angels character to the particular unit they where with, or augmenting the Dark Angels Special Rules. I’m sure there army many Dark Angels players that would like to have seen the return of Namaan. HQ selection – The HQ’s that can be selected are good. I would have liked some of them to be a bit better at close combat, but if Games-Workshop is moving away from close combat, then I guess this is a pointless issue to have. There are only a few minor issues that I really have, and they are leveled at the special characters. I don’t understand why Azrael is not an Eternal Warrior but Sammael is. I just feel the Grand Master of the Dark Angels, the head honcho, the grand leader should be immune to instant death. Along those same line, why are all the swords that the three grand master have different stats: the Sword of Secrets, the Sword of Silence, and the Raven Sword? It’s the Raven Sword that bothers me the most. Again, Sammael has a better piece of equipment than the Grand Master of the whole chapter. I personally would have liked to see all these swords standardized, since that appears the route Games-Workshop wants to take. If I were to do it, I would make each sword S +2 AP 2 Master-Crafted, Two Handed. Finally, there is the glaring mistake that is Asmodai. I honestly think this guy was an 11th hour addition just before the book was about to be sent to the printers. There is so much there that could have been. Instead, we get an interrogator chaplain that’s 30 points more expensive that doesn’t have a shooting attack, only adds the Fear special rule, and has a knife that can cause Instant Death but is a Specialist Weapon. Why in the world would I take him? Command Squads – I love the idea of the command squads, and I have tried them in every game that I’ve played with the Dark Angels. However, there are some big problems that I have with them. The obvious is the banners. This is another really cool concept that makes Dark Angels stand out that was implemented very poorly. With the advent of Precision Shot, the banner is a big and easy target, and this is made worse by the cost of the banners. Any competent player that has Snipers will target the command squad and put any and all Precision Shots on the banner, and in a single turn, a good 30+ point banner is gone, probably before it got to do what you bought if for. The thing that makes this flaw even more grating is how simple it could have been fixed. Games-Workshop could simply make the banner carrier a character, that way he could get the Look Out Sir rule, or make it to where a member in the squad picks the banner up, that way the squad would have to be killed to the man in order for the banner to be taken out. All three command squads suffer from this flaw. Granted, the Deathwing Command squad doesn’t suffer as much with the barer having a 2+ armor save and the possibility of 3++ with a storm shield, but the Ravenwing Command Squad really suffers from the banner being a target since the squad only has three guys. Another issue the command squad suffers from is the champion. A champion, it’s an upgrade that players should want to take that should have a lot of flare and fluff behind it. However, the Blade of Caliban makes it completely pointless to take a champion. I don’t understand how the Blade of Caliban is the only sword, so far, that is Unwieldy and only adds a +1 to strength. I would much rather have just a regular power sword. When compared to the weapon a Deathwing champion gets, the flaw becomes almost comical. As with the grand masters’ swords and the banner barer, this flaw is made worse by the simplicity it would take to fix the issue: give the champion a relic blade or a regular power sword. I’ll continue my discussion and critique in a few more posts. I don’t want this to turn into a novel, and I don’t want to show all my cards about the personal update that I’m doing to the Dark Angels codex. Again, I want to stress that this is not me bashing the codex or calling it horrible. It’s just me simply pointing out the flaws that I see and wondering why they are there, and what could have been done to fix them. No codex is perfect, and I understand that if Games-Workshop introduced to many special and wonderful little things, then we would see the cheese mongering that made the cropped up in the later days of 5th edition. I just would like to see the First Legion, the army that introduced me to Warhammer 40k receive the same love and special treatment that other codices received. I don’t want the attitude and feeling that as one poster on a forum thread put it, “Dark Angels are never treated fairly,” to be standard that is accepted. Today, I took a big step in how I plan to paint my models. 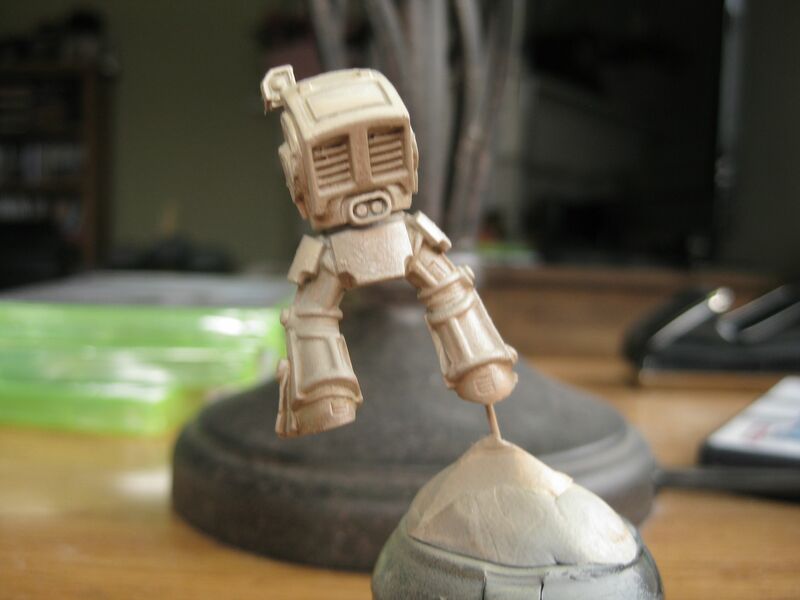 I’ve decided to use my airbrush more, and see if I can perform the zenith method of painting miniatures. I recently invested in a few colors from the Badger Minitaire paint line since they’ve been getting some positive reviews from the Warhammer community. With the Dark Venegence starter box still sitting in my work area unpainted, and the new Dark Angels codex being out, I decided I would attempt this new method of painting on a new Dark Angel army. The weather here has finally cooperated enough to allow me to get out in the garage and do a quick test model of the Deathwing paint scheme I plan to do. Here are the results. Again, this was my first attempt at doing anything more complicated than laying down a base coat with an airbrush, and I didn’t go into painting the rest of the model. This was simple to see how I could do the zenith painting, and what the armor would look like with the colors I picked. I used Badger Minitaire Earth, Bark, and Mummy. The results are not too bad. I would have liked the shadows to be a little dark and the gradient to be a bit more pronounced. Though, I have the feeling that if the gradient was more pronounced I wouldn’t like it. Both of these issues could probably be corrected with putting down more of the Earth color and being a little bit lighter on the two high light colors. I do, however, really like the colors. 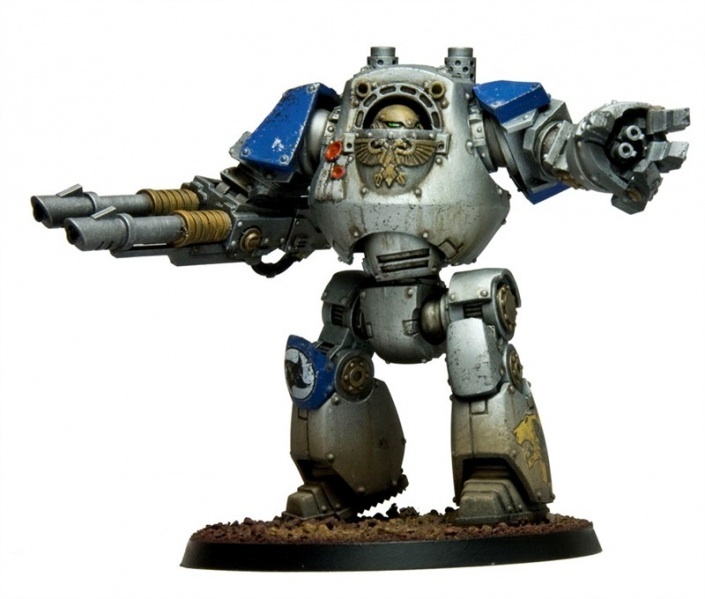 Personally, I think this paint scheme is more in line with what the Deathwing should look like instead of the strange yellow looking scheme that’s in the new Dark Angel codex. I’ll try one more test model taking into account the things I learned with this model. If the armor comes out satisfactory, then I’ll finish the entire model moving onto the other new method I’ll be employing with my models: oil washes. If you have any tips or trick, thoughts, comments, or criticism, let me know in the comments.